Hey, Hey! 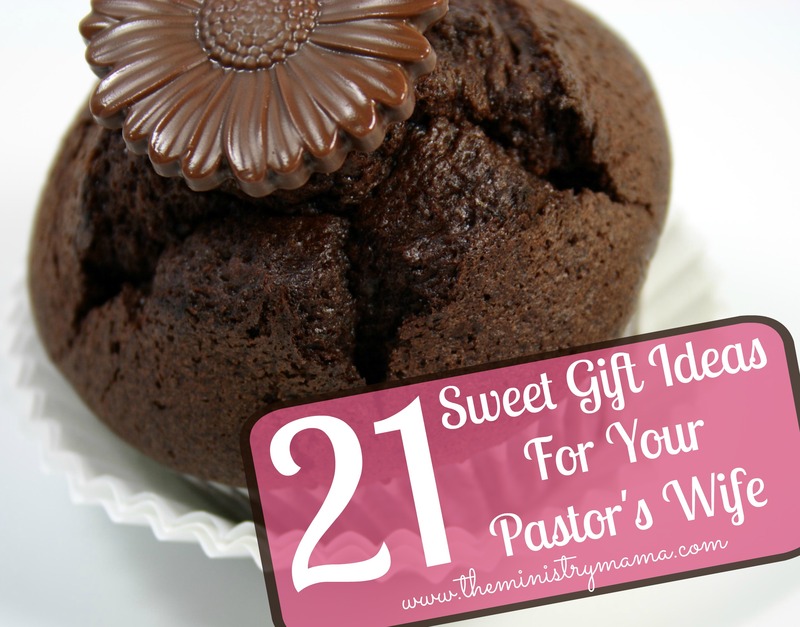 My guess is that if you’re reading this you’re a blessing to your pastor’s wife or you’re a pastor’s wife curious to know what “sweet” gifts are on this list. I always want to encourage you to consider your pastor’s wife’s likes and interests. While I humorously keep mentioning chocolate throughout this list, if your pastor’s wife does not like chocolate or is allergic, the gift will be a waste. You want to give your pastor’s wife a sweet gift that she will enjoy and delight in, and want to use for the purpose you’ve given it to her. For her, to use for herself! On a sweet note, let’s get to this enjoyable list! 1. Chocolate – need I say more? 2. Make a Cupcake Bouquet. Find an easy tutorial at 52KitchenAdventures.com. 7. Flowers – Think of a fresh bouquet, a floral arrangement, a flowered scarf, or another cute floral find. 8. Essential Oils – these are very popular and come in different sweet smells. 9. Her Favorite Candy. Perhaps, it’s chocolate? 10. A Fruit of the Spirit Devotional book. 12. Baked goodies – chocolate cake, chocolate chip cookies, brownies, chocolate cream pie, you get the idea! Check out this free printable gift tag on Positively Splendid that says “Life is Sweeter Because of You.” It would be cute to add to a box of baked goodies. 13. Honey and Tea with a Tea Cup and Saucer. 14. A Gift Card to an Ice Cream Shop or a Frozen Yogurt Place. 15. Sweet Drink – she might like something sweet like lemonade or raspberry tea. 16. Flavored Syrup(s) for teas and coffee. If you like to drink coffee yourself, then see the next item. 17. Take her out for coffee and dessert and treat her like a sister. 19. Your Sweet Spirit – Having a sweet attitude toward your pastor’s wife will be a blessing to her and help her have a sweet spirit toward you. 20. The Sweetness of your Friendship – At times in the course of ministry life, each pastor’s wife really need quality friendships outside and inside their church. Your friendship and availability is a way to help relieve stress. Be a friend at church by being a great volunteer. Be a friend outside by having a listening ear and a learning heart about her. 21. Oh, and don’t forget about more chocolate!